The Audi TT is often accused of emphasizing form over function, but the TT RS performance model is right at home on a twisty road. The hottest version of the TT (a car that celebrates its 20th anniversary this year) gets a handful of updates for the 2019 model year. The updated version makes its United States debut at the 2019 New York Auto Show later this month and should go on sale shortly after that. The biggest change is a redesigned front fascia. Audi said the fascia was reshaped for a more aggressive look, but the differences are so subtle that you’ll have to park the 2019 TT RS next to a 2018 model to really notice the differences. Audi said designers made some other styling tweaks as well, including to the rear spoiler. LED headlights, taillights, and daytime running lights are standard, as are 19-inch wheels. OLED taillights and 20-inch wheels are optional extras. The current-generation TT launched Audi’s Virtual Cockpit, which replaces traditional analog gauges with a reconfigurable digital display. The Virtual Cockpit has since spread to other Audi models, and other automakers have come up with their own digital instrument clusters. but the TT remains one of the best applications of the concept. The TT isn’t exactly a family car, so Audi felt safe eliminating the central touchscreen and making Virtual Cockpit the only in-car display. That allowed designers to give the dashboard a streamlined, uncluttered look. That look doesn’t change in the 2019 TT RS, but Audi did add a standard wireless charging pad. However, Apple CarPlay and Android Auto are not standard equipment. A 680-watt Bang & Olufsen audio system is also available. Audi did not mention any mechanical changes. The TT RS is powered by a 2.5-liter turbocharged inline-five engine. The unusual five-cylinder configuration (which is also used in Audi’s RS 3) references the engine that built Audi’s performance reputation in classic race cars like the Ur Quattro. That original engine was developed so engineers could increase displacement without the packaging difficulties of a longer inline-six, but it became a signature feature for Audi. 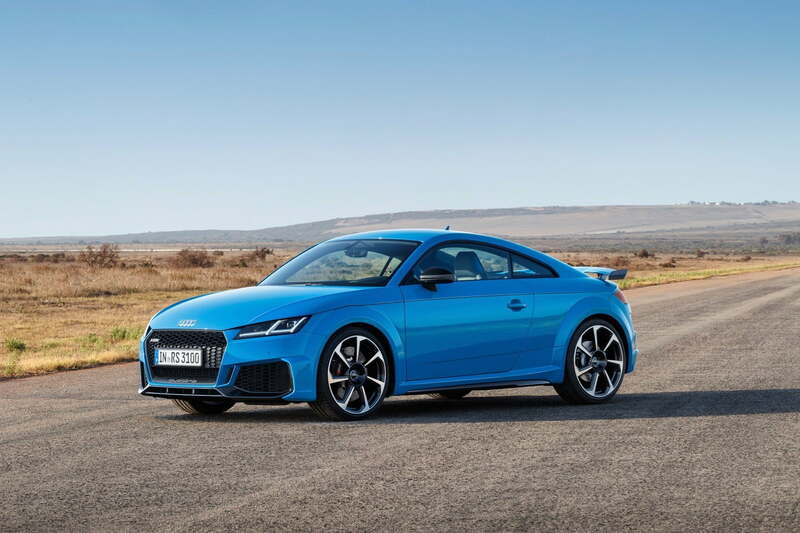 The modern inline-five makes 394 horsepower and 354 pound-feet of torque, which will get the TT RS from ) to 60 mph in 3.6 seconds, according to Audi. A seven-speed dual-clutch transmission is the only available gearbox, with standard all-wheel drive. Up to 100 percent of power can be sent to the rear wheels, according to Audi, in order to give the car a more lively feel. The 2019 Audi TT RS goes on sale later this spring. Pricing starts at $67,895, which includes a mandatory $995 destination charge.